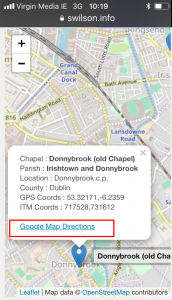 Various updates and fixes to the mobile phone compatible section of the website and also added new pages to shows historic c1840 Catholic and Church of Ireland parish details and Church locations. Church markers show GPS & ITM coordinates, and also include a link to show directions to selected church using Google Maps. 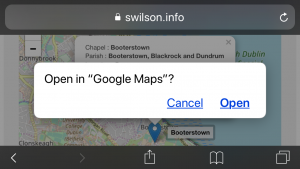 Google Maps requests permission to access your location. 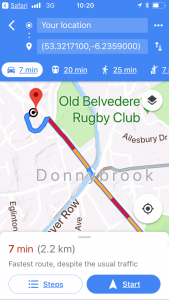 Directions from your current location to the historic Church site. 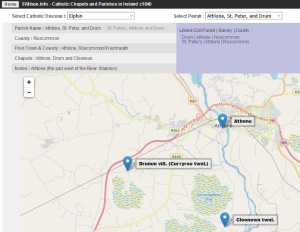 This entry was posted in Catholic Parish, Chapels and Churches, Church of Ireland, Directions, Family History, Ireland, Maps and tagged c1840, Catholic, Church of Ireland, Historic, Maps, Parish. Bookmark the permalink.